He describes himself as the world’s number one wealth coach, a friend of celebrities and a billionaire in the making. But despite his cunning-sounding surname and the gravity implied by the two initials that precede it, JT Foxx doesn’t even have a Wikipedia page to his name. Who on earth, I wondered, attends such events? I signed up. I prepared for it by watching a poorly produced and comically absurd promotional documentary titled “JT Foxx: A Biography: The Untold Story of a Millionaire Underdog.” It includes awkwardly-staged endorsements from Eric Trump, son of the US President, Apple co-founder Steve Wozniak and actor Al Pacino. The video claims to have been produced by “Hollywood Kingmaker Films,” an impressive-sounding entity I can’t find mention of anywhere else on the internet. 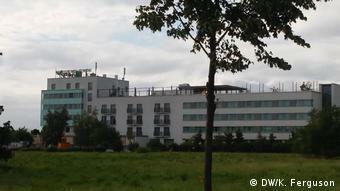 The walk from the train station to the hotel takes you past fields and down roads decidedly off the beaten track. It wasn’t long before I met others going the same way. The dress code was the giveaway. The men were in suits and carried briefcases. The women were wearing dresses and heels. One told me she was a musician from London. She’d just brought out an album but needed to make some money. Speaking, she’d thought, could be the way. JT Foxx’s own entrance was underwhelming. Less charismatic than the support act and sporting two pins on his lapel (one the American flag, the other the German) he opened with a rant about Berlin’s airports. In the hours that followed, JT Foxx fed the 167 people gathered a cocktail of hyperbole concerning his fame and wealth, vacuous clichés masquerading as business advice and menacing sales pitches. He made no secret of the fact that he pays celebrities tens of thousands of dollars to appear on stage with him. He claims to pay John Travolta half a million dollars for a joint appearance. His connection with the Hollywood A-lister apparently earns him enough street cred to multiply the money he invested several times over. The first product JT Foxx tried to sell seemed harmless enough: a set of CDs, apparently featuring business advice he himself had paid a former coach $250,000 for. The catch was that there were only 15 copies available. They would be for sale at the back of the room during the first break. The woman in the headscarf was among several people who joined the line to buy. As the rest of us filed out, I was desperate to find out how the rest of the crowd felt about JT Foxx. The purpose of the rest of the event was to “select” people to turn into “mega speakers.” As it turned out, this meant anyone who was willing to spend between 4,000 and 20,000 euros on the spot. 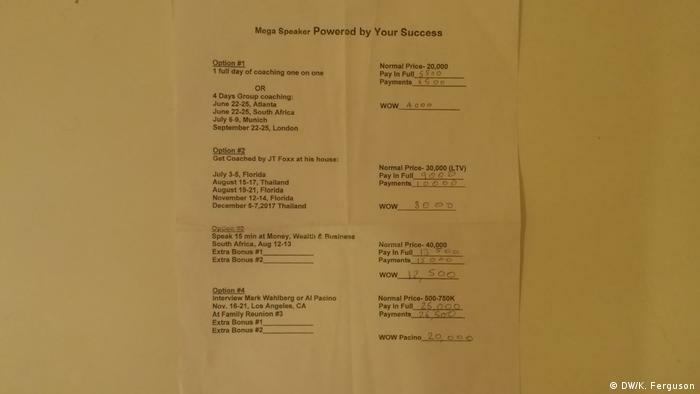 This is how it happened: We were given a sheet of paper with four “options.” Our job was to write down the usual prices and then JT Foxx would announce the incredible, one-day-only-just-for-Berlin offer. Option 1: A day of one-on-one coaching or four days of group coaching with JT Foxx. The cost: 4,000 euros. Option 2: Getting coached at one of JT’s mansions, in either Florida or Thailand, costing just 8,000 euros. Option 3: The opportunity to speak for 15 minutes in front of a large crowd at the “Money, Wealth and Business” conference in South Africa, for 12,500 euros. A unique opportunity to build your brand. Option 4: The once-in-a-lifetime, career-enhancing opportunity to interview either Al Pacino or Mark Wahlberg for only 20,000 euros. Not less than eight people chose at least one of the options. Most of them were young women. They were then taken out to the lobby for one-on-one interviews with members of JT Foxx’s team. It wasn’t long before their credit cards came out and JT Foxx, once again, became tens of thousands of euros richer overnight. 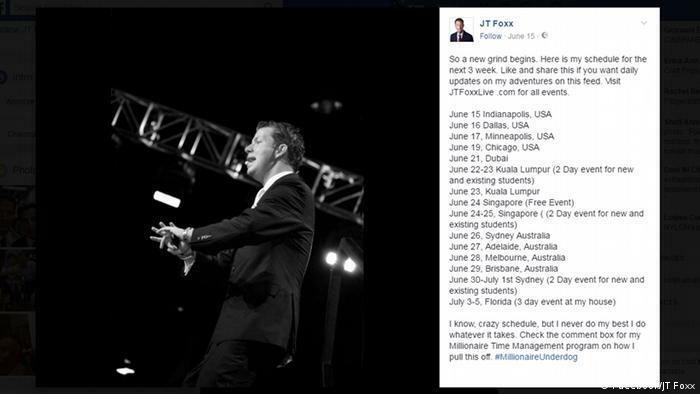 Before the Berlin event, JT Foxx had held similar workshops in Singapore, Dublin, Manchester, London, Birmingham, Stockholm, Edinburgh, Glasgow and Amsterdam. The second leg of the tour sees him speaking in four US cities, as well as Dubai, Kuala Lumpur, Singapore and Adelaide. And each time, he is likely to get what he needs: a handful of people willing to gamble away their savings for a shot at stardom.